First, preheat your oven to 375°. 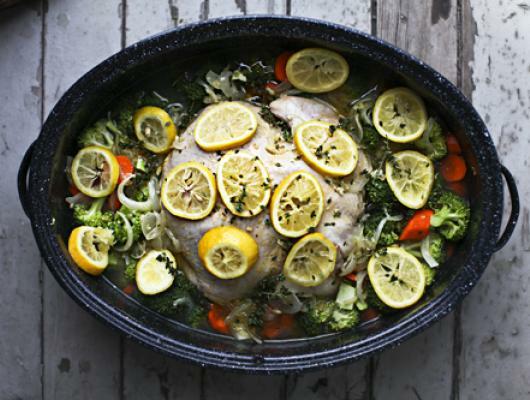 Then, place your chicken in a baking pot or pan. Be sure to check and remove that little bag of goodies from inside of the chicken. Pour in your chicken stock, apple cider vinegar, and 1c. water. Depending on how many vegetables you end up adding, you may add more water. Wash your vegetables. Peel and chop your carrots, and chop your broccoli. Throw your veggies into the pot. Cut and add potatoes at this time if you are going for the full chicken dinner. Also, If you are serving more guest, add more of each vegetable. Now, grind a little fresh pepper onto your chicken. Set aside. Cut your onion and mince your garlic. In a sauce pan, add onion, garlic, and olive oil. Sautée for several minutes. Pour onto your chicken. You should have excess olive oil in your pan that you can pour and rub over your chicken. Last steps: Slice your lemons. Squeeze them over your chicken and all about in your pot. I like to lay some on my chicken and then just throw the rest in. Then add a few sprigs of thyme. I through in several whole springs, as well as sheered and sprinkled some onto the chicken. Cover and place your beautiful chicken into the oven on 375° for 1 hr. After an hour, un-cover and cook for at least 30min. until done and browned on top. Then, remove from the oven, and serve. This is a dinner dish for the whole family! 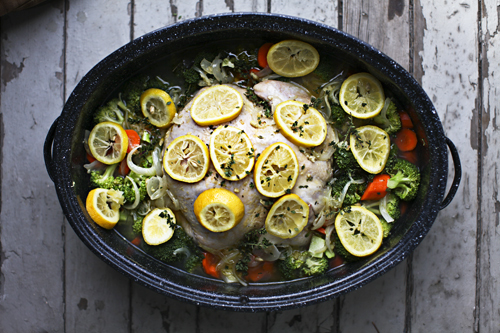 This baked whole chicken dinner, made with thyme, lemons, carrots, broccoli, onion, garlic, and veggie stock is delicious and easy!